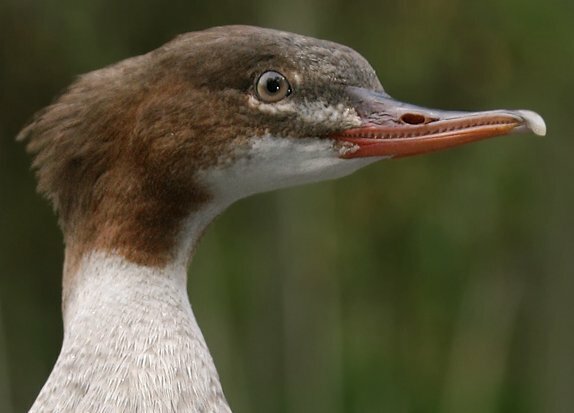 Unlike other ducks, common mergansers possess saw-like teeth in their becks. This is a distinguishing characteristic from other ducks. This feature makes them excellent hunters. The serrated beck aids common mergansers in capturing and holding onto fish. Common merganser becks are wider and thicker at the base compared to the red-breasted merganser (a close relative) which also helps them grasp fish. The amniotic egg was a huge advancement in the animal world. This is what allowed organisms to move away from the water. The amniotic egg gives the embryo an ideal environment to develop without drying out. The egg is broken down into various components to provide the embryo with water, nutrients, and waste remove. The outer shell of the egg is strong and sturdy for support but also allows for gas exchange of oxygen and carbon dioxide. Flight is made possible by a few different adjustments of bird’s body. Birds have reduced skeletons which contain hollow bones. This makes the bird much lighter so they can fly easier. Birds also have a keeled sternum which provides extra area for muscle attachment. Although common mergansers are very fast flyers, it takes them a while to actually get air borne. 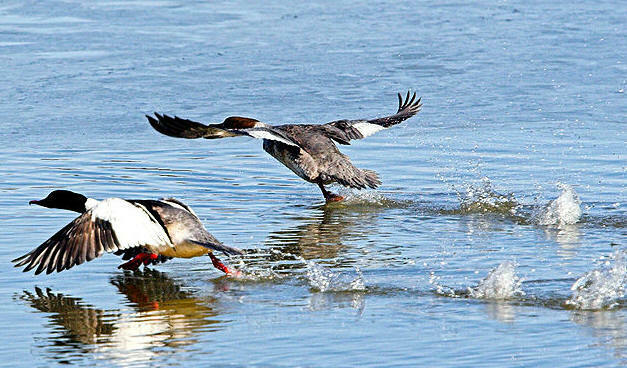 When a common merganser takes off, it must “run” across the water surface for several yards before entering the air. The wing arc on common mergansers is rather shallow compared to how fast it can fly. The wings barely extend below the plane of the body. During flight, common mergansers tend to fly in lines a few feet about the water’s surface.